British detectives are investigating whether a violin recovered during a police operation in Bulgaria is a $1.8 million Stradivarius stolen from a London train station more than two years ago. The 300-year-old violin was snatched from Euston station in central London in November 2010, when its owner, Korean-born classical musician Min-Jin Kym, stopped at a restaurant to buy a sandwich. Two bows stored inside the instrument's case, a Peccatte worth 62,000 pounds and another made by the School of Bazin valued at more than 5,000 pounds, were also taken. 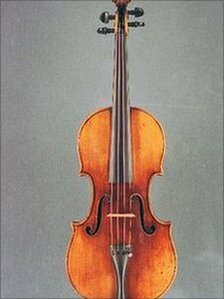 The antique violin, made in 1696, was never found. A reward of 40,000 pounds was offered for its safe return. Officers from the British Transport Police (BTP) were working with Bulgarian authorities following the discovery of the violin, a BTP spokesman said on Monday. "BTP detectives are aware of the recovery of a violin in Bulgaria and will investigate, with insurers, underwriters and international colleagues, whether it is the 1696 Antonio Stradivarius antique violin stolen from a café at Euston rail station in November 2010," the spokesman added.